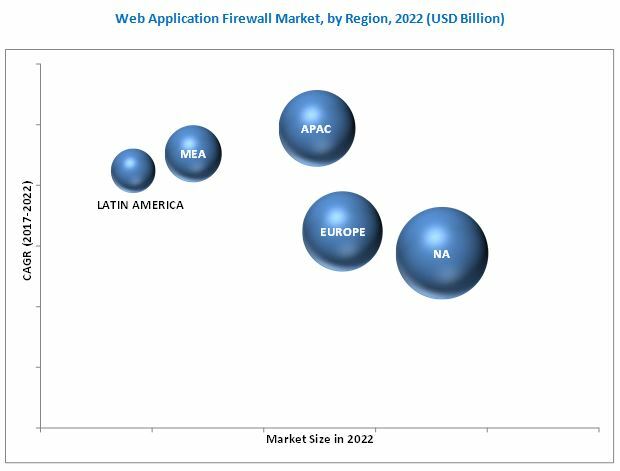 [150 Pages Report] The web application firewall market size is expected to grow from USD 2.09 Billion in 2016 to USD 5.48 Billion by 2022, at a Compound Annual Growth Rate (CAGR) of 18.3% during the forecast period. The base year considered for the study is 2016 and the forecast period is from 2017 to 2022. The main objective of the report is to define, describe, and forecast the web application firewall market size on the basis of components (solutions and services), organization sizes, industry verticals, and regions. The report provides detailed information on the major factors (drivers, restraints, opportunities, and challenges) influencing the growth of the market. The report attempts to forecast the market size with respect to the 5 main regions, namely, North America, Europe, Asia Pacific (APAC), Middle East and Africa (MEA), and Latin America. The report strategically profiles the key market players and comprehensively analyzes their core competencies. It also tracks and analyzes the competitive developments, such as joint ventures, mergers and acquisitions, and new product developments, in the WAF market. The web application firewall market includes various vendors providing WAF solutions, inclusive of hardware appliances, virtual appliances, and cloud-based firewall, to commercial clients across the globe. Companies such as Imperva, Akamai Technologies, Barracuda Networks, Citrix Systems, Cloudflare, DenyAll, Ergon Informatik, F5 Networks, Fortinet, Penta Security Systems, Radware, Trustwave and NSFOCUS have adopted partnerships, agreements, and collaborations as the key strategies to enhance their market reach. These Web Application Firewall Software Vendors are rated and listed by us on the basis of product quality, reliability, and their business strategy. Please visit 360Quadrants to see the vendor listing of Web Application Firewall Software. The study answers several questions for the stakeholders, primarily, which market segments to focus on in the next 2 to 5 years for prioritizing efforts and investments. Further breakdown of the US and Canada market into solutions, services, organization sizes, and industry verticals. Further breakdown of the UK, Germany, and France market into solutions, services, organization sizes, and industry verticals. 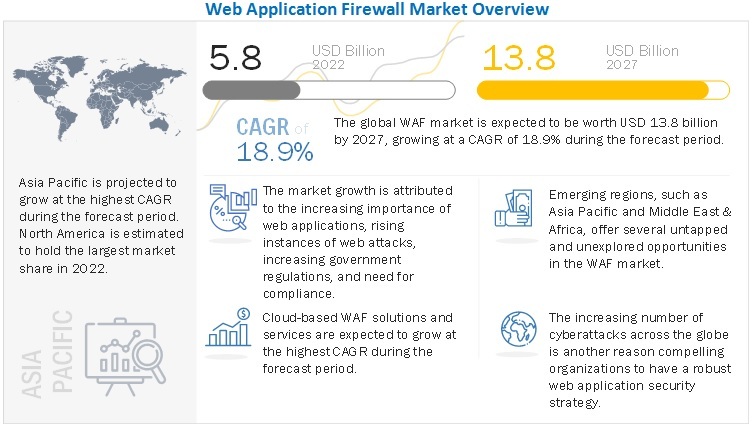 MarketsandMarkets forecasts the global Web Application Firewall (WAF) market size to grow from USD 2.37 Billion in 2017 to USD 5.48 Billion by 2022, at a Compound Annual Growth Rate (CAGR) of 18.3%. The web application firewall market is segmented on the basis of components (solutions and services), organization size, vertical, and regions. The solutions segment is further segmented into hardware appliances, virtual appliances, and cloud-based. The professional services segment is further segmented into consulting, support and maintenance, training and education, and system integration. Cloud-based WAF solutions are available as software bundles with a full stack of threat prevention technologies that provide the best protection against vulnerabilities, such as malware, phishing, ransomware, and the emerging cyber threats. Cloud-based WAF solutions provide protection and safeguard the network, even if users are off their Virtual Private Network (VPN). They offer capabilities, such as bot detection and enforcement, access control, caching, threat intelligence, Application Program Interface (API) security, malware detection, and Distributed Denial of Service (DDoS) mitigation. Cloud-based deployment is a cost-effective solution that delivers a better user experience, with scalability options to safeguard the data. Cloud-based deployment of WAF solutions is said to be gaining pace, due to the increased adoption of cloud computing technologies across various organizations. The growth in the cloud-based solutions is attributed to the fact that there has been a significant increase in the government regulations in the WAF market. The web application firewall market is expected to be witnessing a traction, due to the increasing importance of web applications, the rise in instances of web attacks, such as cyber theft, espionage, vandalism, and fraud, government regulations, the need for compliance and the technological proliferation, and the increasing penetration of IoT. The market for the professional services segment is likely to be growing, as individuals, Small and Medium-Sized Enterprises (SMEs), and large enterprises are concerned about ensuring secure access to their networking devices. Companies offering professional services provide consulting to facilitate the successful deployment of WAF solutions. Professional services are required during and after the implementation of WAF solutions. These services include planning, designing, consulting, and upgrading. Consultants, user behavior analytics experts, and dedicated project management teams help provide professional services. These professionals specialize in the design and delivery of critical decision support software, tools, and services. The trending WAF technologies are offering machine learning and artificial intelligence, which play vital roles in the WAF arena. WAF solutions and services can be deployed over an enterprise’s cyber infrastructure using hardware WAF appliances, virtual appliance-based systems, and cloud-based applications. The major vendors offering supporting services include system integration and training, along with support and maintenance, for a seamless transition and implementation of WAF solutions. North America is expected to top the globe in terms of presence of security vendors and security breach incidents. Therefore, the web application firewall market is said to be dominated by North America, which is considered to be the most advanced region for cybersecurity technology adoption and infrastructure. The world is becoming more connected and the Internet of Things (IoT) trend is gaining prominence. The awareness about the need to protect the network infrastructure has been identified as the most critical economic and security challenge in the region. The growing concern to ensure the protection of financial and sensitive data has increased the government intervention in the recent years. With the increasing numbers of connected devices, new forms and varieties of cyber-attacks are joining the threat landscape. The APAC region is expected to witness a significant growth in the web application firewall market, due to the increasing adoption of web and mobile applications for business operations. The APAC WAF market covers Australia, New Zealand, Japan, China, India, and Singapore. Countries across this region have a large number of SMEs, which are using the traditional defense mechanism. Therefore, advanced and sophisticated threats are hard to be detected. According to the 2016 BSA Global Software Survey, 6 out of 10 computers in Asia Pacific (APAC) run on non-genuine software and are thus prone to the rising cyber-attacks. The high cost of deployment for appliance-based WAFs and the competition with integrated Unified Threat Management (UTM) solutions is likely to be the main restraining factor for the growth of the WAF market. However, the recent developments, new product launches, and acquisitions undertaken by the major market players are expected to be boosting the growth of the market. The study measures and evaluates the major offerings and key strategies of the major market vendors, including Imperva, Akamai Technologies, Barracuda Networks, Citrix Systems, Cloudflare, DenyAll, Ergon Informatik, F5 Networks, Fortinet, Penta Security Systems, Radware, Trustwave, and NSFOCUS. These companies have been at the forefront in offering reliable WAF solutions to the commercial clients across diverse locations. *Details on Overview, Strength of Product Portfolio, Business Strategy Excellence, and Recent Developments Might Not Be Captured in Case of Unlisted Companies.